On sort of a whim, I decided to go to New York the day after New Year’s. Well, technically, I actually did the deciding a few weeks before New Year’s, when I was looking at the NHL schedule, but it only took a few minutes to go from “Hey, why don’t I go to see that game in Newark” to “Hey, I’ve never actually had a chance to play tourist in New York” to “Why don’t I see what’s playing on Broadway that weekend” to buying all the tickets and making hotel reservations. Here are some random thoughts about what I did and saw. The one anchor point starting out was that I wanted to see the Canadiens play the Devils on Friday, January 2, at the Prudential Center. I had complete freedom of transportation mode — I could drive, take the bus, take the train (express or “regional”), or fly. The Prudential Center is right in downtown Newark, two blocks from Newark Penn Station, so I looked closely at the rail option, and found that the Acela Express fare from Route 128 to Newark was not-terrible enough to eliminate air travel from consideration. I looked at the cost of driving, considered the difference in parking costs between Newark and Route 128, and decided that I’d rather take the train — this also gave me a bit more freedom in terms of scheduling, since I could nap on the train. I didn’t seriously consider taking any of the various bus services, most of which don’t stop in Framingham and so would require more complicated travel arrangements at this end. I chose a fairly early departure from Boston, which would get me in to Newark Penn a little after 1 PM, allowing me time to check into my hotel and then go back into the city for a few hours before the game. I also chose a late return trip on Sunday, primarily because I could get a AAA discount on the fare, but it also worked out well in terms of being able to do some additional sightseeing in Manhattan. Considering both Amtrak’s official (although apparently not enforced) limits on carry-on baggage, and the fact that I would be lugging all of my stuff through Manhattan on Sunday afternoon until my train home, I had to make a decision whether to bring my camera bag or my audio bag, and ultimately decided to bring my audio bag. (In theory I could have brought both, but only at the cost of carrying a heavy backpack in addition to my roller bag, which I didn’t really want to do.) As a result, the photos you see here are less numerous than they otherwise would be, and of a lower quality since they were taken with my phone camera rather than my proper camera (which a number of the places I went wouldn’t have allowed in anyway). My initial thought for a hotel was to find a Choice Hotels property (I’m in Choice’s loyalty program) in Newark that looked reasonable. The only one I could find, however, was quite a distance north of Newark Penn on McCarter Highway (NJ 21), which meant spending a lot of money on taxis or very inconvenient alternatives for ground transportation. (I decided I probably wouldn’t want to walk it.) In exploring the map of downtown Newark, I noticed that there was a Courtyard literally right next to the Prudential Center, on the Broad Street side, and it turned out that their rate was not much worse than the Choice property’s. (Normally I would not choose a Marriott property, because, well, Marriott, but in this case it was so much more convenient that I was willing to make an exception. There is also a boutique hotel on Broad right next to the Marriott, and a Hilton closer to the train station.) I later described this hotel as being located at the intersection of Old Newark and Gentrifying Newark, across the street from Poverty-Stricken Newark — my seventh-floor window literally looked out across Broad Street at a run-down nail salon, a grey-market electronics store, and a pawn shop. The hotel was clearly very new construction — so new, in fact, that most of the ground-floor retail space had yet to be leased out. The boutique hotel next door was in an old bank building, and a decrepit old Paramount theater was another block away. Between the two hotels was the First Presbyterian Church, a seventeenth-century establishment. When I arrived in Newark, it was bitterly cold and windy, but I decided to walk the four blocks from the station to the hotel so I could get the “lay of the land” as it were. Conveniently, the Acela Express used a platform that had a direct exit to Market Street, which was a block closer to the hotel than the station’s main entrance. I walked past the Newark outpost of Syracuse’s famous Dinosaur BBQ, where I hoped to have dinner before the game, turned left on Broad Street, and checked into my hotel. As a security measure, the Courtyard required key-card access to all guest-room floors, something I’ve never seen in this class of hotel before. The new One World Trade Center building, with spire, as seen from in front of the 9/11 memorial preview site on Vesey Street. The building opened on November 3, 2014. I bundled back up and walked back to the Penn Station to take the PATH train to lower Manhattan, which I’ve never done before. (My one prior experience on PATH was several years ago, on the Hoboken-33rd St. line.) Thankfully, PATH now both issues and accepts Metrocards, so I did not need to get more than one stored-value medium for this trip. On arrival at World Trade Center station, I immediately noticed how much like a construction site it still looks, and the evidence of construction was even clearer outside. I walked as far as the 9/11 Memorial Preview, took some photos of the new World Trade Center tower, and then turned around and took the train back to Newark. I had figured that it would be possible to eat dinner very early — 5:30, say — and still get into the Prudential Center in time to see the teams do their warm-up skate. That was in fact the case, but unfortunately not at Dinosaur: when I stepped in shortly after 5:00, I was told that there was a 90 minute wait, unless I wanted take-out (which of course I didn’t). I resigned myself to getting an overpriced hot dog at the arena, and walked back in the direction of my hotel. I saw what looked like another potential dining option and stuck my head in — they said they could seat me right away, so I after looking at the menu I decided to eat there. I hadn’t realized that this was actually the hotel dining room of the boutique hotel next to mine, and it wasn’t until I asked for directions to the men’s room and was shown out the front door of the restaurant that I finally twigged on to the fact. The service was poor and very slow, even though the restaurant was only about half full, but the food was acceptable if a bit overpriced. 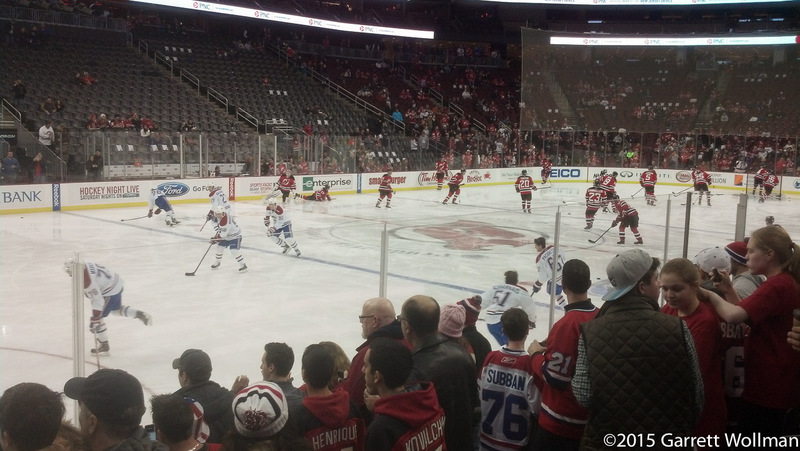 I finished my dinner at about 6:30 and walked half a block to the Prudential Center, showed my ticket, and took my seat. 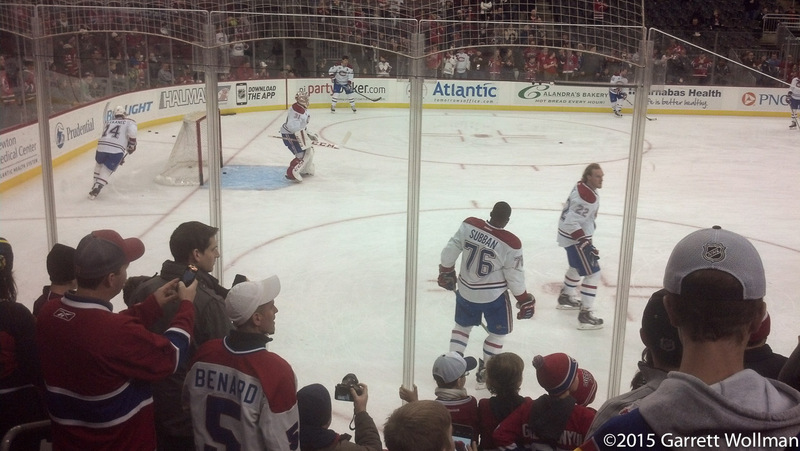 I had a great seat, about eight rows up from the ice and one section to the right of the away bench, and took some pictures during the players’ warm-up skate. I ordered a chocolate glazed yeast donut and a hot chocolate. 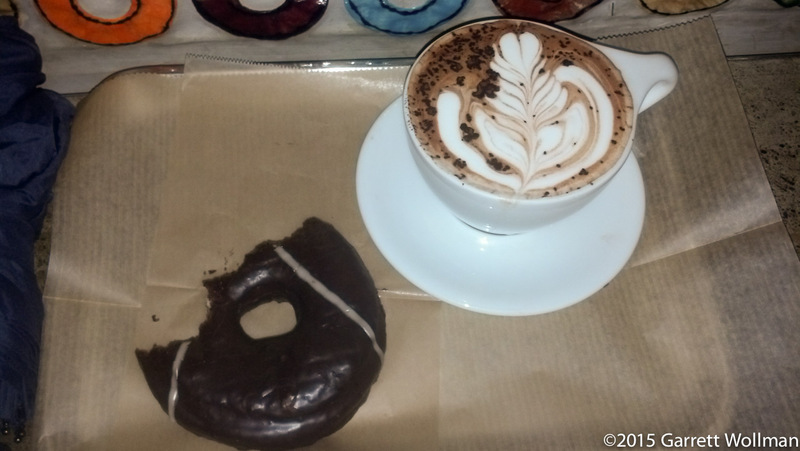 Both were made with Valrhona chocolate (although that doesn’t impress me as much as it was probably intended to). From 23rd St. I hopped back on the subway and headed (after some substantial and unexplained delays) down to Rector St., and walked from there down to the foot of Broadway and Bowling Green, where the United States Custom House is located. When the original World Trade Center complex opened, the Customs Service moved from the Custom House to leased space at WTC. The Custom House fell into disrepair, but was eventually repaired and refurbished (still under federal ownership) in the 1980s. Coincidentally, George Gustav Heye’s Museum of the American Indian ran into difficulty in the 1980s as well, and a deal was struck to transfer the Heye collection to the Smithsonian, where it would form the nucleus of the newly chartered National Museum of the American Indian. Since it would take several years to identify a location for NMAI on the Mall in Washington and then design and build a brand new museum, and since the Heye collection was already located in New York, the Smithsonian (which already operated the Cooper-Hewitt Design Museum in New York City) opened a New York branch of NMAI, and the General Services Administration gave the new museum the first two floors of the Custom House. The main NMAI location in Washington opened several years ago, but the New York location has remained open, as the NMAI George Gustav Heye Center. Like other Smithsonian museums, admission is free but a bag inspection is required. There are three main gallery spaces in the Heye Center, all surrounding the Custom House’s second-floor clerk’s desks, under the great rotunda. There’s a historical exhibit about the Custom House itself occupying half of the clerks’ space: when the building was constructed, customs brokers would come to the Custom House to present their bills of lading and their duty payments to customs clerks for filing, but changes in the shipping industry meant that this sort of in-person processing was now done by customs agents at the ports, so a large public space such as this was surplus to requirements. Even after 9/11 when the Customs Service moved back into the Custom House, the much smaller complement of central staff could easily fit into smaller offices on an upper floor of the building. 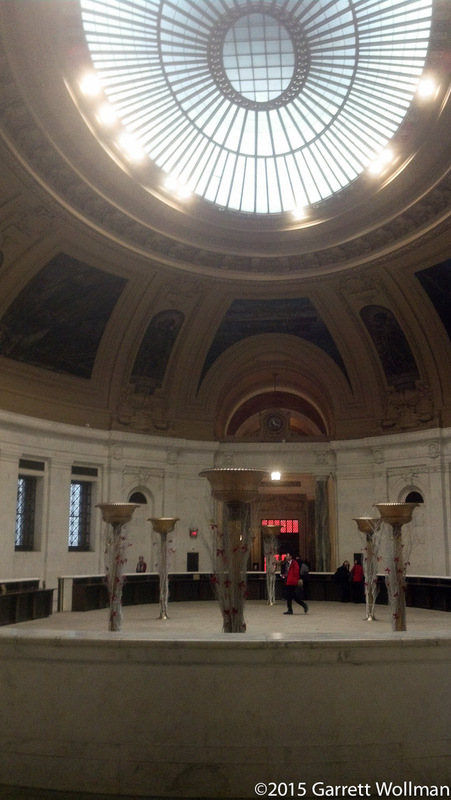 I’m looking towards the main entrance, which leads to a grand staircase and Bowling Green IRT station; my back is to the middle of the three main galleries, which has a permanent exhibition of (mostly Heye collection) artifacts from native communities throughout the hemisphere. To my left and right are galleries for temporary exhibits — when I visited, the gallery on my right had an exhibit of Navaho turquoise jewelry made by members of the Yazzie family, and the one on my left had an exhibit of never-before-shown black-and-white medium-format photographs taken by Horace Poolaw, a Kiowa man in mid-century Oklahoma, documenting everyday life for non-reservation native people living in the former “Indian Territory”. When I left NMAI, it had begin to rain, as had been forecast, and I was grateful for the subway station at the foot of the stairs. I took the F train over to the Lower East Side (conveniently, the 5 train was running local that day, replacing the 6, as I would otherwise have had to make two transfers rather than just one) to have lunch at The Meatball Shop on Stanton St. One of the things that makes New York unlike most every other city in the US is that its unique combination of a very large, dense population with tiny apartments containing even tinier kitchens means that even exceedingly niche restaurant concepts can find sufficient custom to thrive — a gourmet donut shop like Doughnut Plant could exist in almost any urban area, but a restaurant that serves only meatballs is something that you really wouldn’t expect to see anywhere outside of New York. (At least until it becomes the next franchise fast-food fad, like cupcakes and grilled cheese in recent years.) The Meatball Shop offers four different basic kinds of meatballs, and they can be had in a variety of forms — as normal meatballs, “smashed” as burger-like objects, as the meat filling in a sub/grinder/hero — with a variety of accompaniments and sauces. 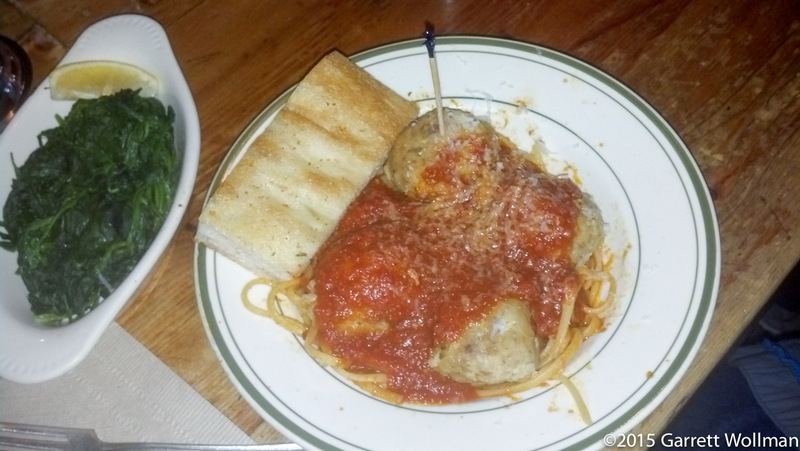 Lunch consisted of spicy pork meatballs with traditional sauce on linguine, with a side of steamed spinach. From Stanton Street I walked down to Essex Market, because I wanted to see what the New York outpost of Cambridge’s famous gourmet shop, Formaggio, looked like. Being a small tenant in a much larger food market, Formaggio Essex concentrates on the small, high-value items that made Formaggio’s name in Boston: cheese, chocolate, condiments, and charcuterie — other purveyors in Essex Market have the bakery and produce business sewn up, and Formaggio’s space is too small to try to compete with them. I bought some chocolate that I hadn’t seen in stock at Formaggio in Cambridge when I was last there. While I was in Essex Market, I also got some dessert in the form of “cake balls” — dense little balls of cake and frosting, slightly larger than a donut hole and far tastier. The cake balls were the very first thing I saw when I entered the market, but I don’t recall the name of the stall where they were sold. From there — with four hours still to waste but all the museums closing — I headed back downtown to see the MTA’s new Fulton Center building and its oculus. Fulton Center is located atop the Fulton Street subway stop, and is a new combined headhouse and transfer station for the 2, 3, 4, 5, A, C, J, Z, and R services, serving the financial district. It’s intended to have two floors of retail establishments outside the fare-paid zone, but the MTA has evidently not leased any of it yet. By this time the sun had set and it was pouring outside, so after a brief look around Fulton St. itself, I headed back uptown to Times Square. On Sunday morning, I was still considering sticking around in Newark for long enough to get lunch at Dinosaur, since it seemed unlikely that I’d be back there any time soon, but ultimately I decided I would be better served heading (with all my luggage) back into Manhattan and uptown to the American Museum of Natural History. So I walked back to Newark Penn and bought another NJT ticket for the commuter train into New York Penn. (I could have taken PATH instead, for half the price, but PATH on weekends operates a limited schedule with the Newark-33rd St. and Hoboken-33rd St. lines combined.) When I arrived in Manhattan, I knew that I needed to add three more fares to my Metrocard, but after charging my credit card, the MTA vending machine spit out my Metrocard, claiming that it was damaged, and gave me a receipt. The clerk in the MTA booth was entirely unhelpful, and eventually sent me to another guy, who was also unhelpful — there is apparently no way, even in the presence of a damaged Metrocard with matching receipt from a fare vending machine in the same station for the MTA’s customer service representatives to issue a refund or even waive the $1 fee for a replacement card. All I could do, both men said, was mail the damaged card and the receipt to the MTA and some day they might get around to issuing a refund (which would probably be another Metrocard that would expire before I got a chance to use it anyway). So I ended up buying a second Metrocard, again putting three fares on it, and taking the C train to 81st St. I hadn’t taken note of the platform signs which would have directed me to the museum’s direct entrance from the subway station, so I exited to the street and walked down to the newest section of the museum, the Rose Center, which houses the Hayden Planetarium of which Neil deGrasse Tyson is director. Conveniently, the museum’s coat check and automated ticket machines are located in this new section. With only a little hesitation, I was able to drop my rollerbag at the museum’s coat check, buy a ticket, and then head over to the museum cafeteria to get lunch before exploring the museum. When I bought my ticket, I had an opportunity to buy timed admission to one or more of the special exhibits at the museum. I chose to see an exhibit on natural disasters, which was a complete waste of time and money — it had been developed originally by Chicago’s Field Museum in the late 2000s, and there was literally nothing in it that I did not already know or could not have easily learned by looking at a Wikipedia page. (Of course, the children who are the AMNH’s bread and butter would not necessarily come so well informed.) The AMNH in general is at a curious crossroads of old- and new-style museums: there are numerous modern exhibits clearly designed primarily for children, but they are juxtaposed with a great deal of material in the older style — mounted specimens, dioramas, and the like — that have more adult appeal. One good thing about the natural-disaster exhibit was that the woman checking tickets at the entrance reminded everyone to go see the “Lonesome George” exhibit on the fourth floor as this was its last day. 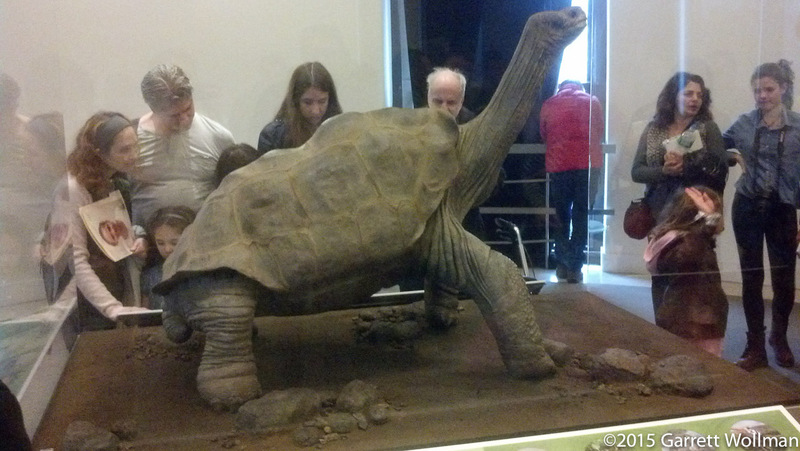 “Lonesome George” was a Galapagos tortoise, the very last of his species, who died a few years back. The park authorities in the Galapagos put together a traveling exhibit after he died. 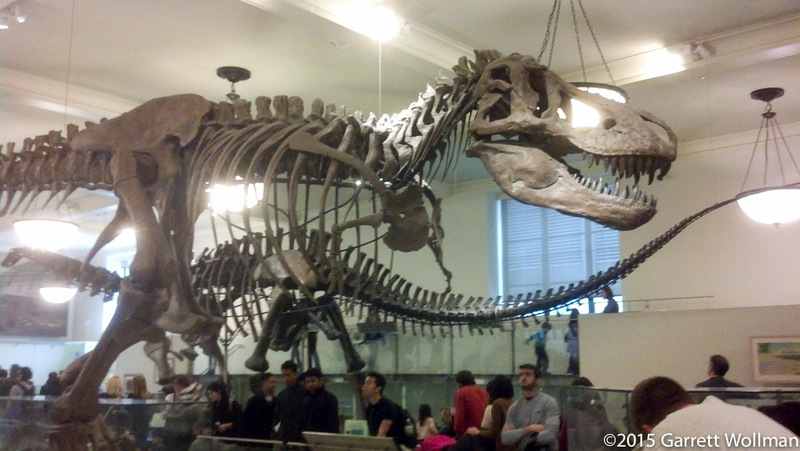 Of course, the main attraction of any natural-history museum is dinosaur fossils. Children of the right age are still as interested in dinosaurs as they ever were, and this actually is a great opportunity to present evolution, in a paleontological context, to impressionable young people. The AMNH fossil exhibits are for the most part organized on cladistic lines, although the explanatory text always uses “group” rather than the technical term “clade”. (There are a few paraphyletic groups presented, with a caution that these groupings are not “groups” because the animals depicted did not evolve from a common ancestor.) The presentation of birds as modern-day dinosaurs is done particularly well, with many of the evolutionary trees having an arrow off to one said labeled “birds” (the only clade indicated that doesn’t also say “(extinct)”). What most people paid their $24 for. I’ve already forgotten which dinosaurs these fossil skeletons represent, but doubtless you can find a ten-year-old who knows just by looking. I left the museum at about 3:30, having seen about a third of the exhibits, and headed over to the Leonidas shop at 485 Madison Avenue. This involved taking the C train back down to Times Square and then an uptown E train over to 5 Av/53 St station; the narrow storefront is located midblock on Madison between 51st and 52nd. The Madison Avenue exit of the subway station is closed on weekends — although the escalators were still running — so I had to double back to Fifth Avenue. I bought more than two pounds of chocolates and truffles, and proceeded to eat far too many of them when I brought them into work on the Monday after I got back. I still had more than an hour to kill before my 6:07 train, so I decided once again to walk to Penn Station, heading crosstown on 49th St. and then down 7th Avenue through Times Square, looking to get a somewhat better view now that there was daylight and it was no longer raining. Along the way, I saw an intriguing storefront for “Baked by Melissa” — they call what they sell “cupcakes”, but in reality, it’s as if you took supermarket mini-cupcakes and cut the bottoms off, so they’re just about half frosting and half cake. I asked, and they claimed that they were under 50 calories each, which was good enough for me to buy six, and I would later eat all of them. (Another example of the niche food that only a market like New York can support, although I found these to be vastly inferior to the “cake balls” I bought the previous day at Essex Market.) When I tried them, I was unable to tell what flavors they were supposed to be — other than the chocolate-dipped one, for obvious reasons — so that’s a product I can definitely scratch off my list. The trip home was uneventful until we got to South Attleborough, where a malfunctioning switch machine had our train stopped for half an hour. Sitting behind me on the train were a woman who was chivvying her daughter into making one last college application before a January 5 deadline. Eventually she figured out that the application would require materials that she didn’t have with her, so they moved on to other topics of conversation. The rain had started back up again, so I was thankful to be in covered parking at Route 128 station (which also meant that there was no snow or ice to scrape off), although I was a bit irritated at all of the escalators being out simultaneously, so I had to wait out on the cold platform for the s-l-o-w elevators to move multiple loads of passengers and their baggage. I got home none the worse for wear, and only a couple of pounds heavier, and went to work the next day with plenty more sweet things that I really needed to get my colleagues to eat before I managed to. This entry was posted in Food, Science, Transportation and tagged American Museum of Natural History, Doughnut Plant, Formaggio, National Museum of the American Indian, New York City, New York City Subway, Newark, Penn Station, Smithsonian, The Meatball Shop, travel, World Trade Center. Bookmark the permalink. Nice shot of the hockey match. This is a great writeup! Also nice to see the origin of the office truffles.